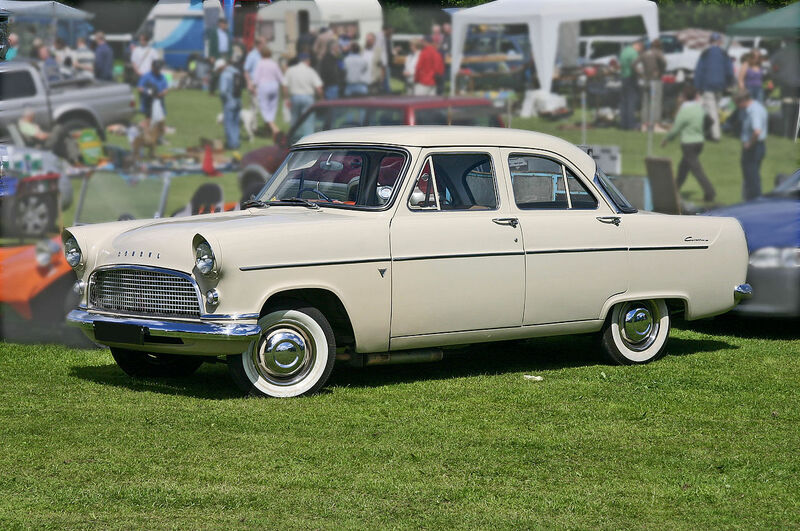 The Ford Consul is a car which was manufactured by Ford in Britain from 1951 to 1962. The name was later revived for a model produced by Ford in both Britain and Germany from 1972 to 1975. 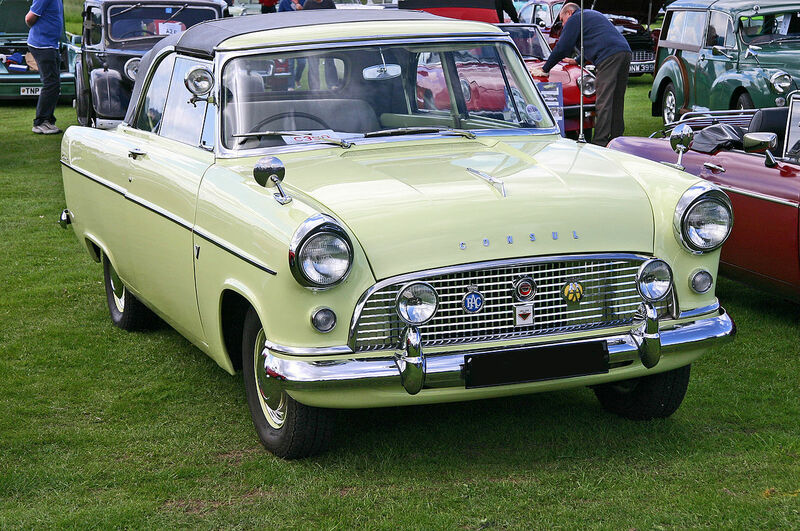 Between 1951 and 1962 the Consul was the four-cylinder base model of the three-model Ford Zephyr range, comprising Consul, Zephyr and Zephyr Zodiac. 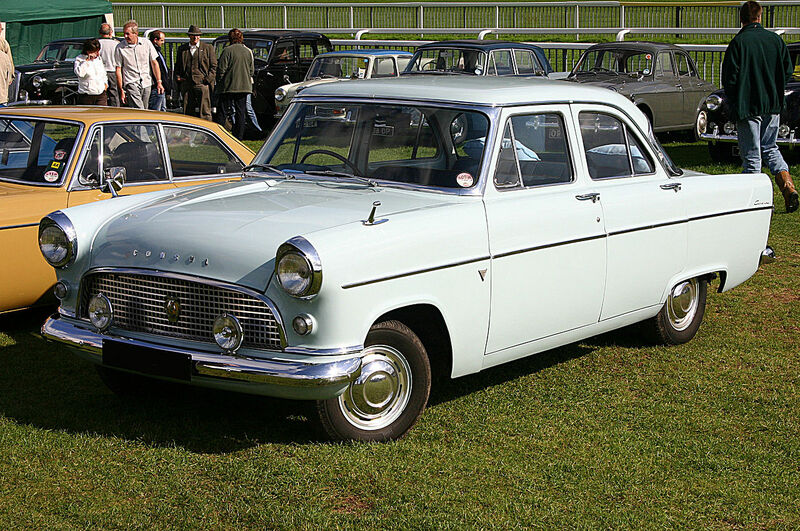 In 1962 the line was restyled, and the Consul was replaced by the Zephyr 4, the mid-range Zephyr model becoming the Zephyr 6 and the top of the range Zephyr Zodiac just being called the Zodiac. 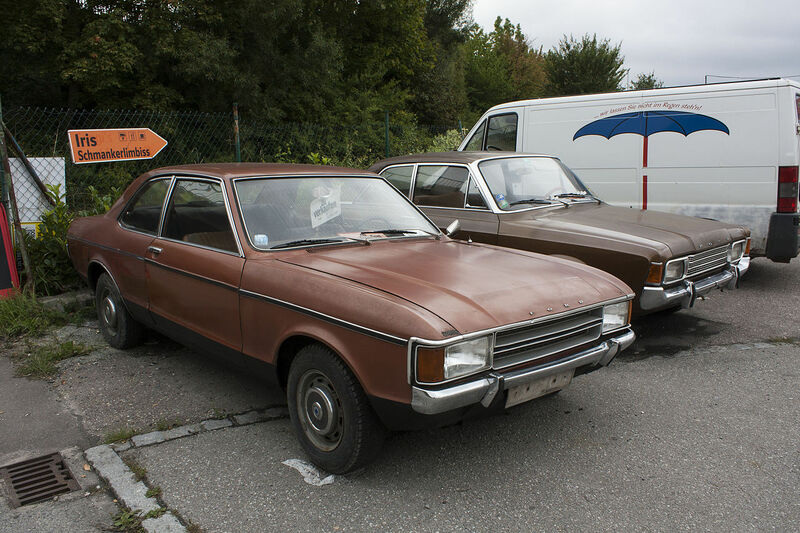 At this point Consul became a range of smaller cars in its own right, initially the Consul Classic and Consul Capri, shortly joined by the even smaller Consul Cortina. The Consul Classic and Consul Capri were only made for two years, before being replaced by the Consul Corsair. 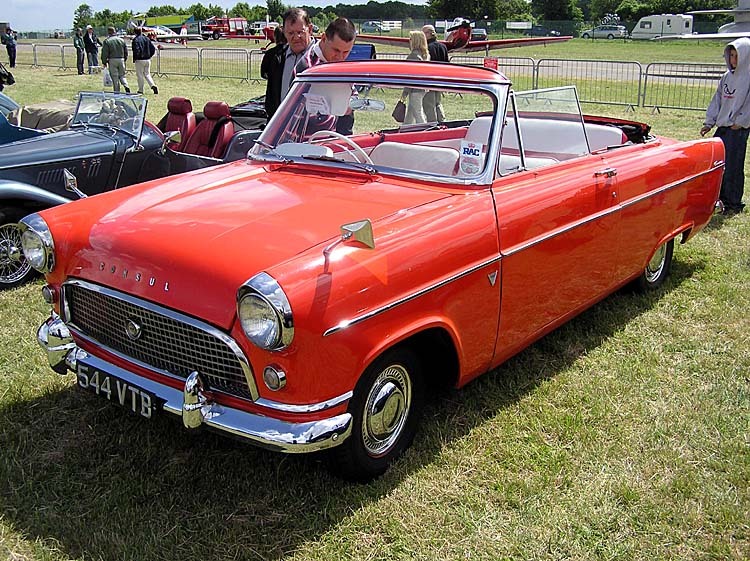 The Classic, the Capri (made until 1963) and the Corsair (made from 1963 until 1970) were relatively short-lived, but the Ford Cortina, after losing (along with the Corsair) the “Consul” tag in 1964, went on to become a best-seller. 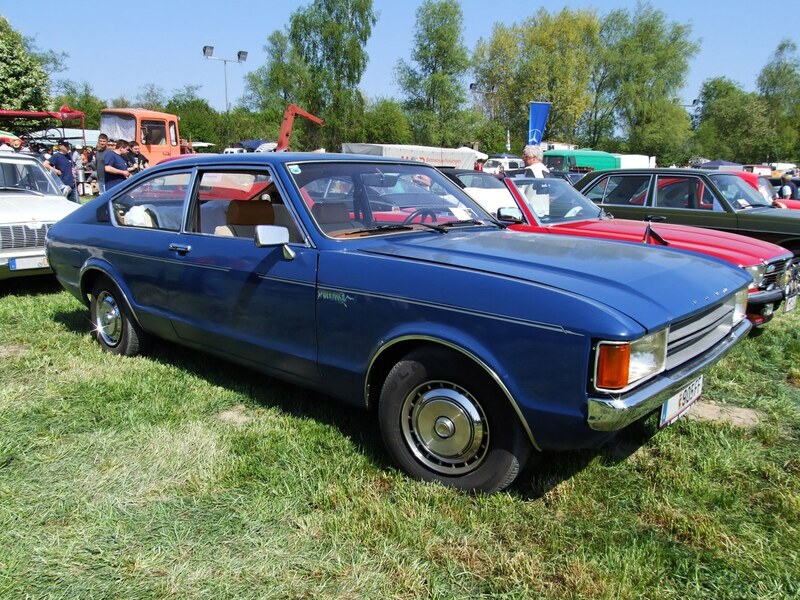 The Consul name reappeared from 1972 to 1975 on a replacement for the Zephyr range, now sharing a body with the more luxurious Ford Granada Mk I. The Capri name by now had also been reintroduced, in 1969. 4-door saloon, estate car, convertible. 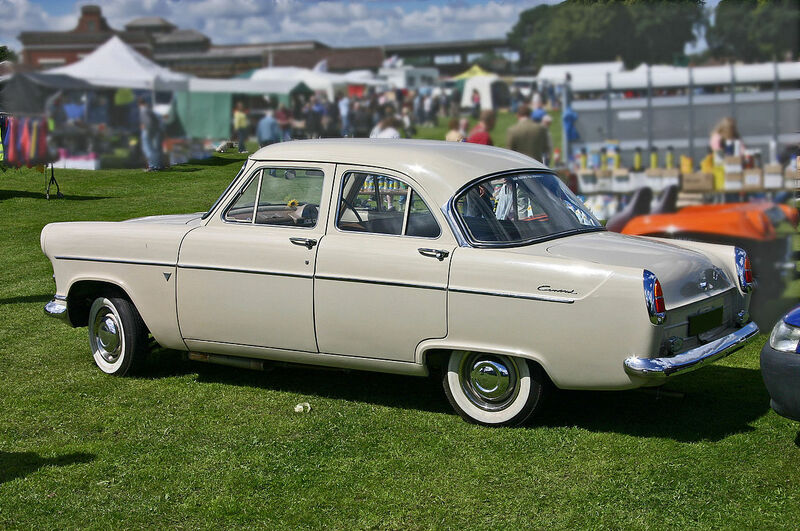 The Consul was first shown at the 1950 London Motor Show and was the start of Ford of Britain’s successful attack on the family saloon car market and replaced the larger-engined V-8 Pilot which had only been made in small numbers. It was given the Ford code of EOTA. 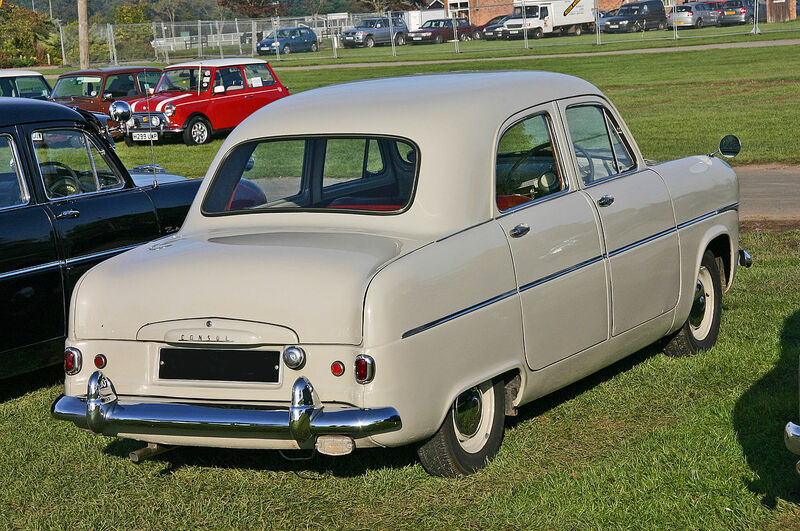 Most cars were 4-door saloons with body design by George Walker of the parent United States Ford company, but a few estate cars were made by the coachbuilder Abbott. 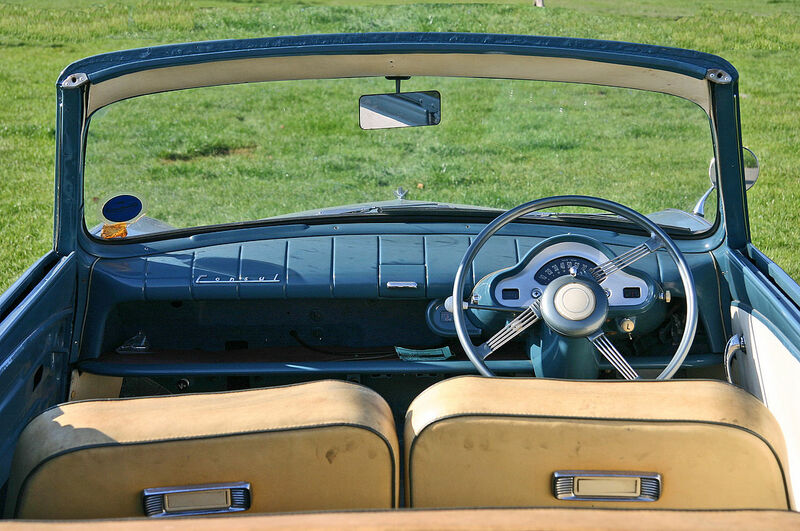 From 1953 a convertible conversion by Carbodies became available. The body was reinforced by welding in a large X-frame to the floor pan. 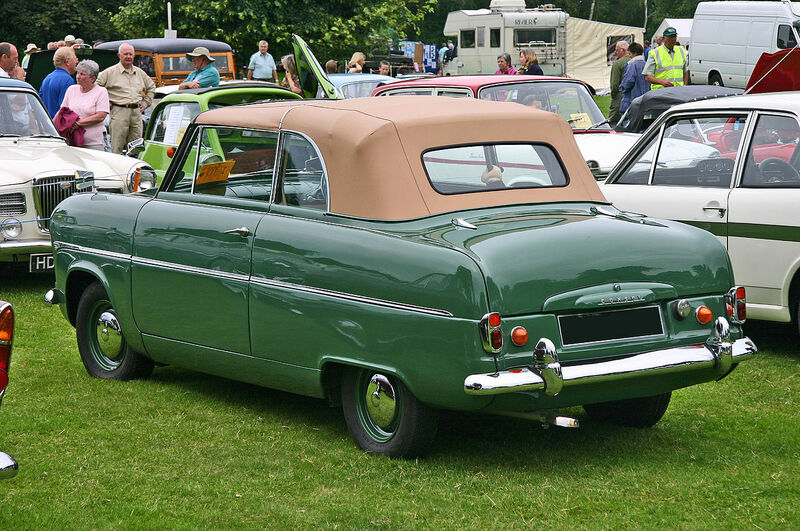 Unlike the more expensive Zephyr, the hood (convertible top) had to be put up and down manually. It was also the first car they built with up-to-date technology. The new 1508 cc 47 bhp (35 kW) engine had overhead valves, and hydraulic clutch operation was used, which in 1950 was an unusual feature. However, a three-speed gearbox, with synchromesh only on second and top, was retained. 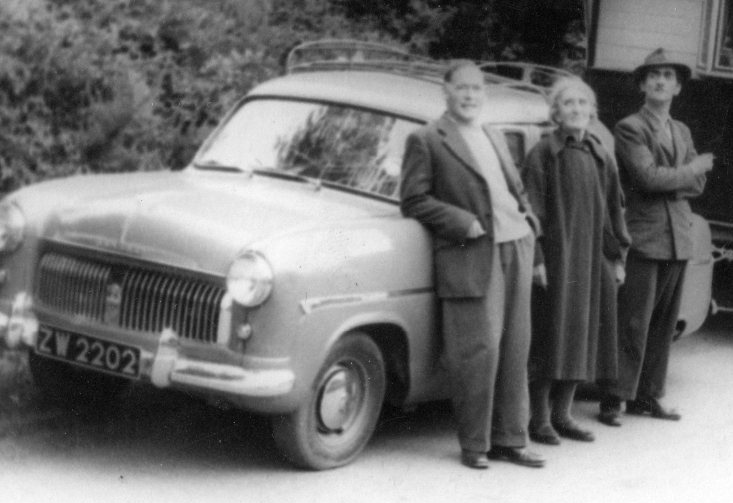 The Consul was also the first British production car to use the now-common MacPherson strut independent front suspension, and was the first British Ford with modern unibody construction. There was a bench front seat trimmed in PVC, and the handbrake was operated by an umbrella-style pull lever under the facia (dash). The windscreen wipers used the antiquated vacuum system: however, they were now operated from a vacuum pump linked to the camshaft-driven fuel pump rather than to the induction manifold as on Ford’s earlier applications of this arrangement. 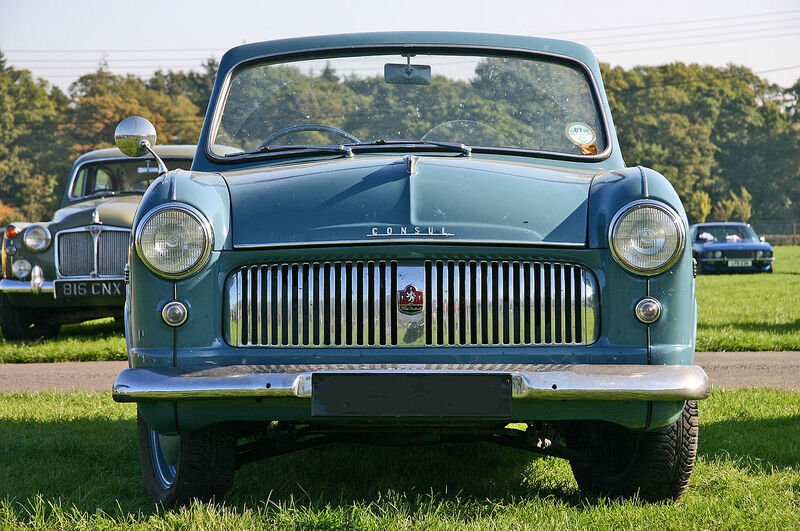 Clearly keen to keep things positive, a 1950 road test by the British Autocar Magazine, reported that the wipers were “free from the disadvantage of early suction driven wipers that dried up at wide throttle opening … and spare[d] the battery”. 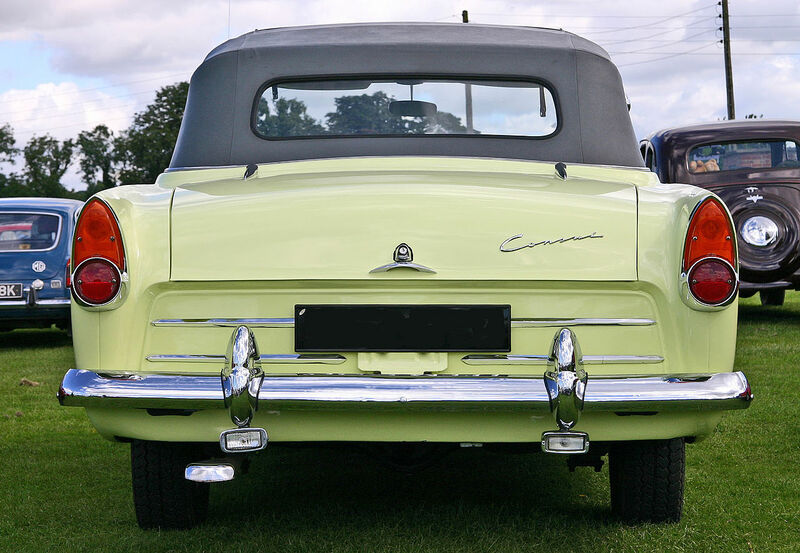 The instruments, consisting of speedometer, ammeter and fuel gauge, were positioned in a housing above the steering column, and there was a full-width parcel shelf on which an optional radio could be placed. A car tested by The Motor magazine in 1953 had a top speed of 72 mph (116 km/h) and could accelerate from 0-60 mph (97 km/h) in 28 seconds. A fuel consumption of 26 miles per imperial gallon (11 L/100 km; 22 mpg-US) was recorded. The test car cost £732 including taxes. 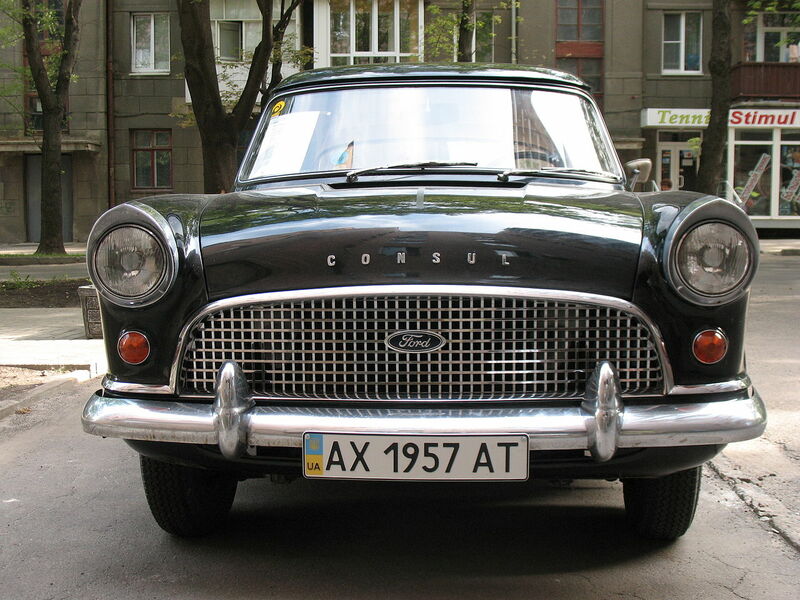 In 1956 a new Consul appeared with the Ford code of 204E. The car was still the four-cylinder sub-model of the Zephyr range, with which it shared the same basic body shell. Compared with the original it had a longer wheelbase, larger 1703 cc, 59 bhp (44 kW) engine and a complete restyle, borrowing cues from the 1956 models of America’s Thunderbird and Fairlane. One thing not updated was the windscreen wipers, which were still vacuum-operated. 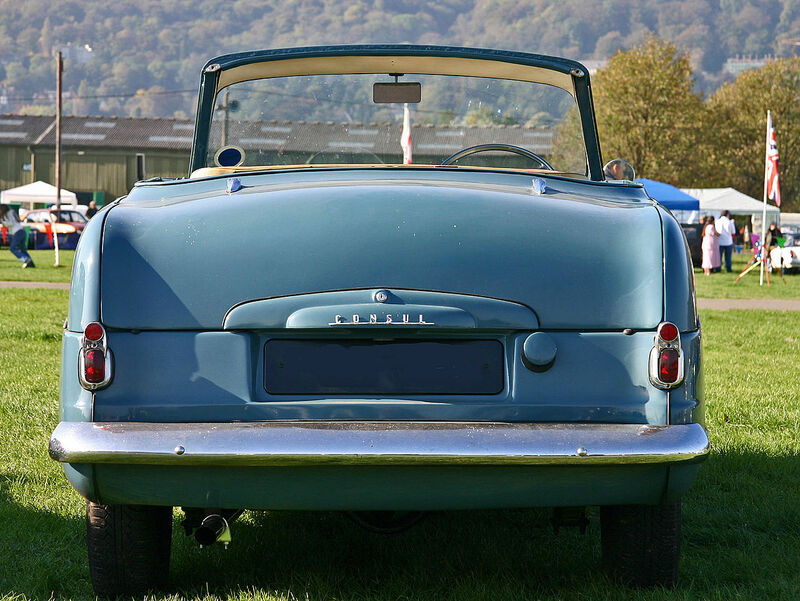 The roof profile was lowered in 1959 on the Mk2 version, which also had redesigned rear lights and much of the external bright work in stainless steel. Front disc brakes with vacuum servo appeared as an option in 1960 and were made standard in 1961 (4-wheel drum brakes only, in Australia). 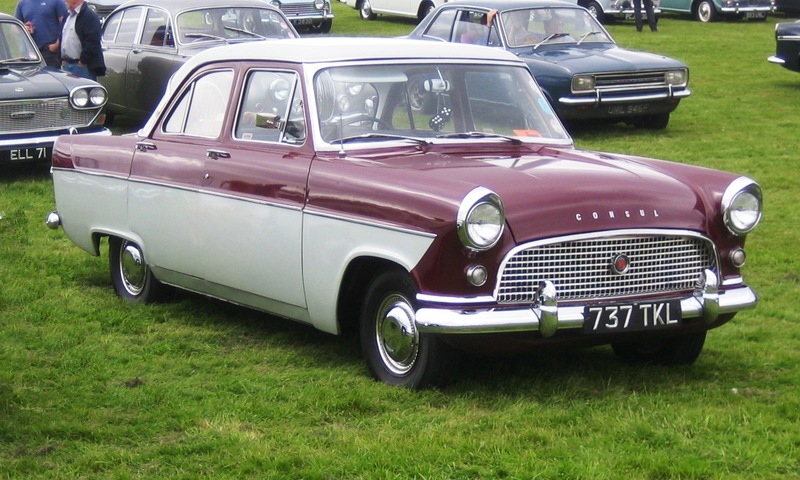 The name became the Consul 375 in mid-1961. The convertible version made by Carbodies continued. A De Luxe version with contrasting roof colour and higher equipment specification was added in 1957. 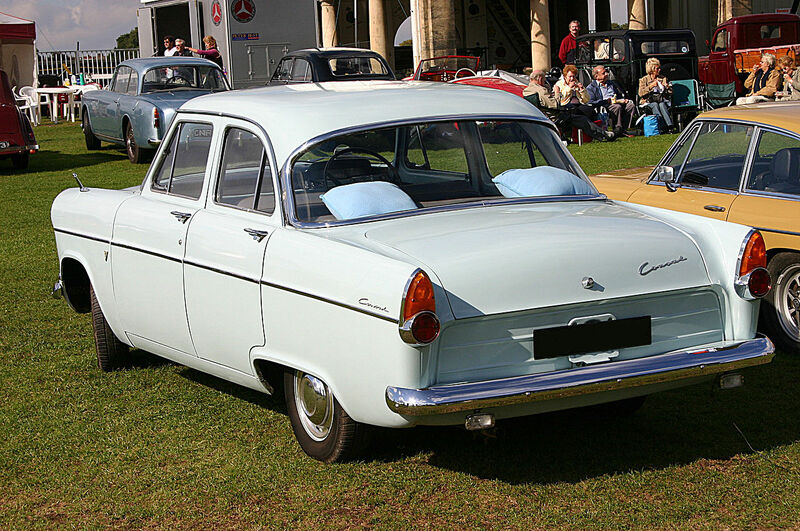 The Australian market had factory-built versions of the coupé utility (pick up) and estate car (station wagon), as well as a locally engineered version of the saloon. 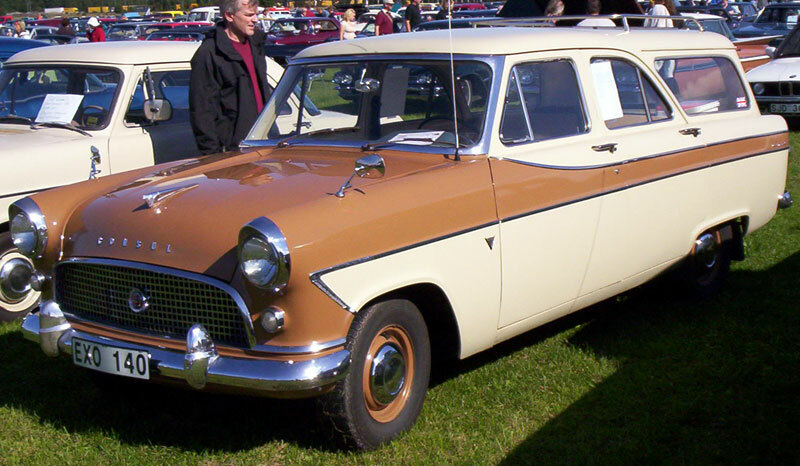 They were also imported by Ford of Canada as a companion to the Falcon. A Consul MkII tested by the British magazine The Motor in 1956 had a top speed of 79.3 mph (127.6 km/h) and could accelerate from 0-60 mph (97 km/h) in 23.2 seconds. A fuel consumption of 22.1 miles per imperial gallon (12.8 L/100 km; 18.4 mpg-US) was recorded. The test car cost £781 including taxes. It was a 1960 Ford Consul MkII that was the taxi that American singer Eddie Cochran died in, and not, as many have stated, a London Hackney Cab. Ford Consul 375 (204E). 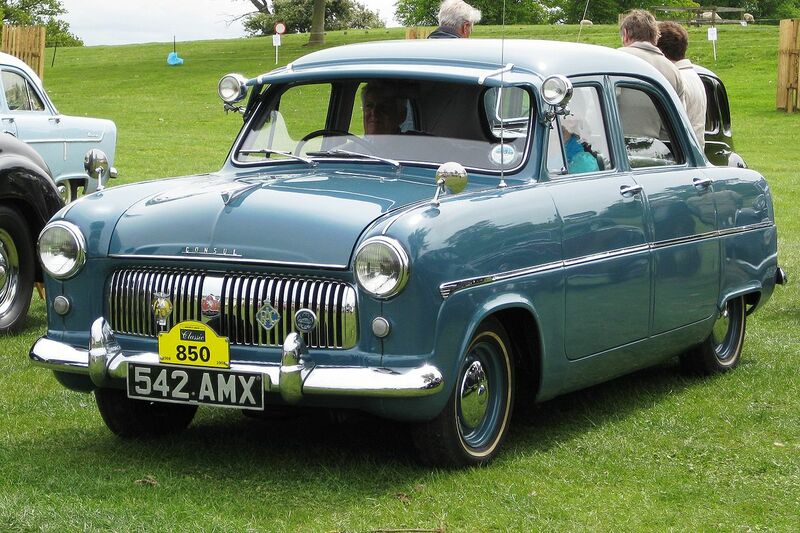 This was the “run out” version of the Consul MkII, introduced in 1961 with the name “375” and a few trim changes. The Ford Consul name was revived in April 1972 for the lower priced, lower specification variants of the newly introduced Ford Granada. 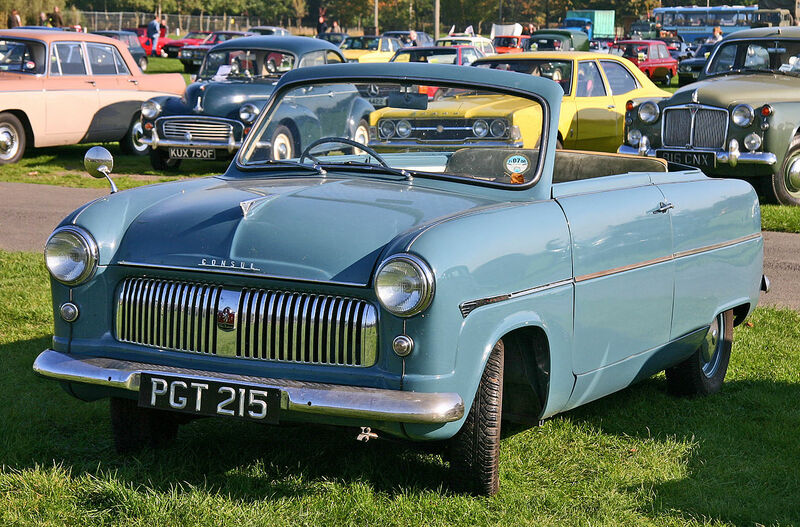 Developed jointly by Ford Britain and Ford of Germany, the cars were built in Cologne in West Germany and in Dagenham in the United Kingdom. Consul models can be identified by a two panel cross-mesh grille as opposed to the horizontal chrome bar grille of the Granadas. Consul, Consul L and Consul GT models were offered and were available in 2-door saloon, 4-door saloon, 2-door coupé and 5-door estate bodystyles. 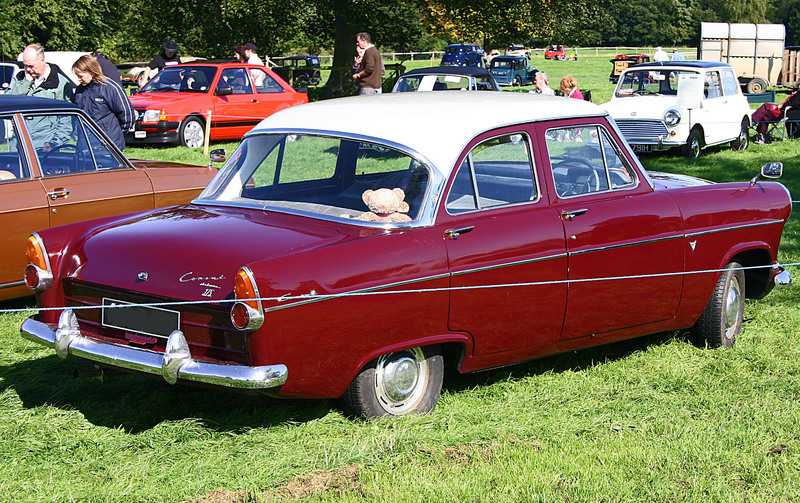 Unlike the previous Zephyr Estate, the Consul Estate was produced by Ford rather than by an outside contractor. The 1663 cc Essex V4 and 1996 cc Essex V4 with 77 and 92 Hp respectively and a 2495 cc Essex V6 with 118 hp (88 kW) were the power units offered in the UK. In addition, the Consul GT was powered by the 2994 cc Essex V6 engine providing 138 hp (103 kW). Because it was less well equipped than the similarly powered Granada, it was approximately 1 long cwt (110 lb; 51 kg) lighter and correspondingly quicker. This version has gained cult status due to its regular appearance in the original series of television show The Sweeney. In late 1974 the Essex V4 was replaced by the 2.0 litre Pinto engine. 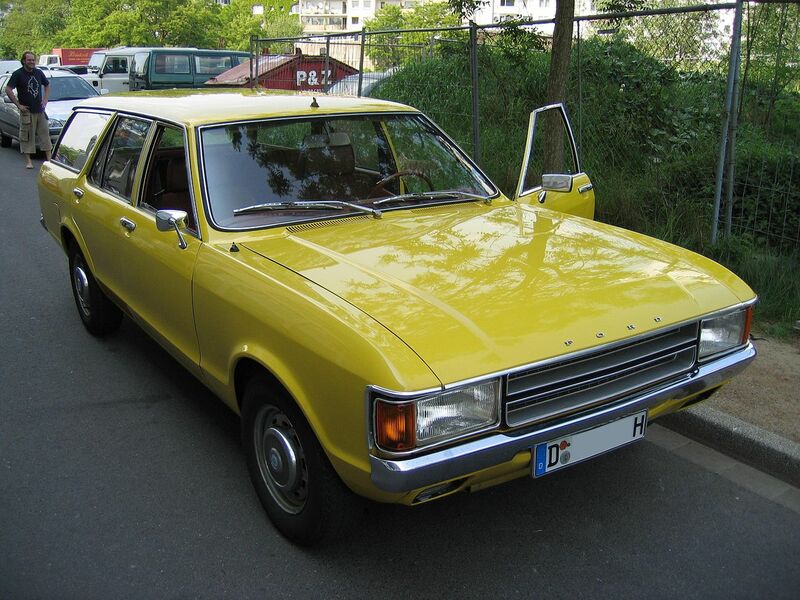 In Germany the Consul was offered with a choice of German built Ford engines, starting with the 1680 cc Ford Taunus V4 engine familiar to drivers of the Ford Taunus 17M. The 2.0 litre Straight-4 and a 2.3 litreV6 were also available. 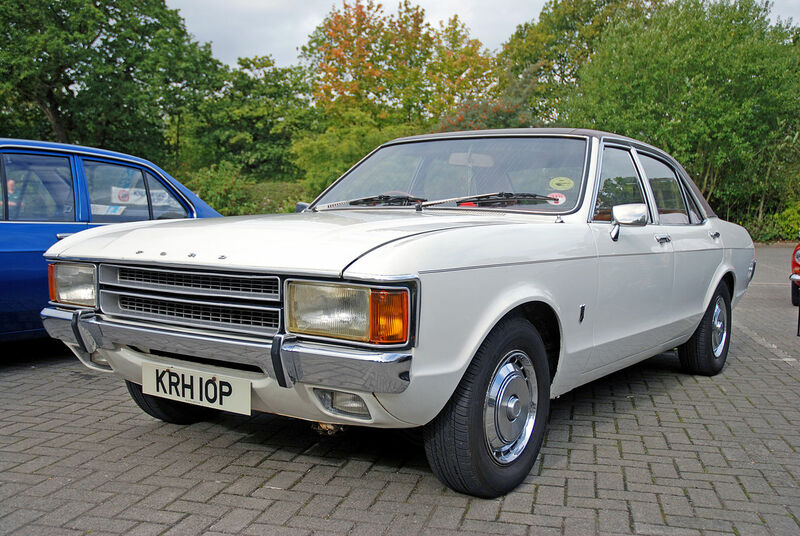 The Consul name was discontinued in late 1975 after the UK Court of Appeal ruled that Granada Group could not prevent Ford registering the name Granada as a trademark. The Granada name was then applied to all models.